WELCOME TO OUR SUMMER 5-WEEK AERIAL TRAINING! 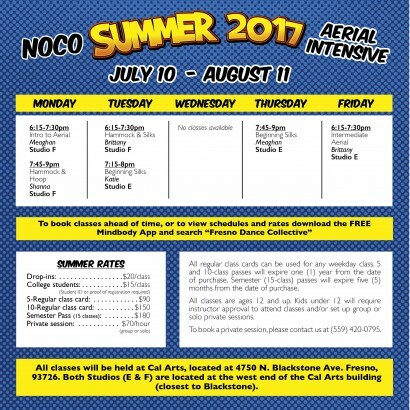 NOCO trains & teaches in aerial arts (also known as fabric, ribbon, tissu, hammock, hoop, silks, circus aerial, etc). NOCOdance is an aerial & modern dance company; we are a nonprofit committed to expanding the culture of dance in Fresno through performance, outreach & education. Offering classes to YOU is a big part of our mission. We host the central valley’s premier aerial training house; we employ 7 certified* aerial instructors and 10 aerial assistants, under the direction of Amy Querin & Kelly Replogle. This allows us to offer a range of BEGINNING to advanced level aerial classes to our community year round. We’ve been teaching aerial in Fresno for 5+ years. If you’re new to us, WELCOME! 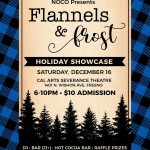 Get more NOCO news by following us on FB, Twitter, Instagram, or our email newsletter. Or come watch a class, schedule a private solo or group session any time throughout the year. Get the MindBODY APP and do all of it on your phone! 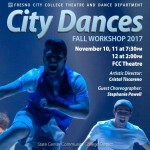 Search for “FRESNO DANCE COLLECTIVE” and see the schedule or pay for class online! *Certifications: AirCat Aerial Yoga/ Boulder Circus Center, CO, International Aerial Teacher Training Program, CA, Perpetual Motion, OKC, OK, and Aerial Physique, LA, CA.